[CURRENT SALES] DOLLS ON SALE! MYOU DOLLS ARE ON SALE! 15% OFF! MYSTIC KIDS DOLLS ARE ON SALE! 10% OFF! EOSDOLL AND LIMHWA DOLLS ARE ON SALE! [4.22.2019] MYSTIC KIDS AND MYOU SALE! All in stock Mystic Kids dolls are ON SALE at 10% off until May 15th! All in stock MYou dolls are ON SALE at 15% off until May 20th! [4.09.2019] RABI RABBIT ON EASTER SALE! For a limited time, the Hujoo 12cm Rabi in Purple on version 2.0 body is ON SALE at only $19.99! That's over 20% off! Also, Nano Freya Special Edition Glow-In-The-Dark is back for a limited time! [2.19.2019] MYOU SHIPMENT HAS ARRIVED! Today's shipment includes: 44cm Martha and 45cm Carr, the newest 2 models to arrive! These are available on the regular BODY-1 in Normal Skin and in Tan, and the new SLIM bodied versions as well! Also arrived: previously sold out 44cm Ling Wei Tan! And also new to the inventory are Tan versions of 30cm Lorina, 30cm Loretta, and 30cm Delia! The latest 17cm darlings from MYou have arrived, meeting Du Du Boy and Feng Linger Girl! Also, we've restocked on the previously sold out 30cm Loretta and Tan Silvia! And also restocks on the ever popular 30cm Delia and Lorina! [12.08.2018] HUJOO NANO FREYA WHITE! 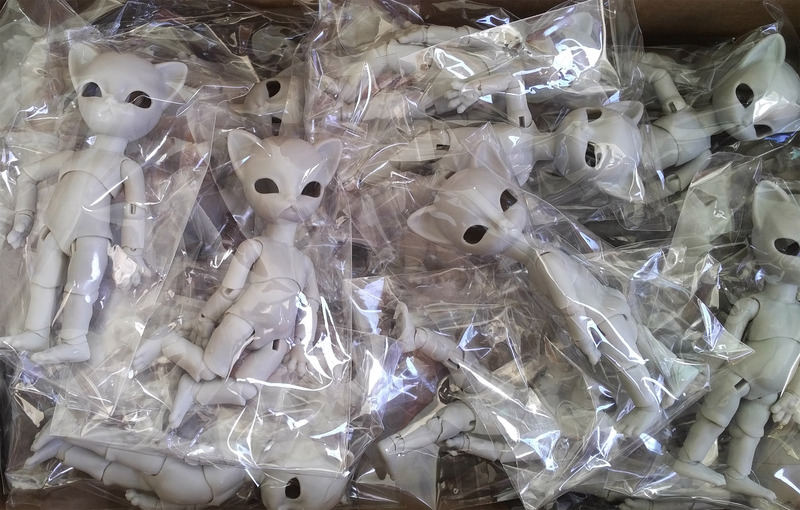 A small shipment of the Hujoo 12cm Nano Freya in White Skin has arrived, just in time to stuff stockings! [11.15.2018] SMALL SHIPMENT OF FALL IN DOLL 27CM FORCE FENNEC FOX WHITE! The White Skintone version of Fall in Doll's 27cm Force the Fennec Fox Anthro has arrived! Limited quantities! [10.15.2018] SMALL SHIPMENT OF FALL IN DOLL 27CM FORCE FENNEC FOX LIGHT GREY! A small shipment of Fall in Doll's previously sold out 27cm Force Fennec Fox Anthro is back in stock! [09.30.2018] SMALL SHIPMENT OF HUJOO 12CM NANO FREYA LIGHT GREY! [09.14.2018] SMALL SHIPMENT OF FALL IN DOLL 27CM RABI HAS ARRIVED! [08.26.2018] MYSTIC KIDS MSD (44-46CM) SHIPMENT! This latest shipment from Mystic Kids restocks on many previously sold out MSD sized (44-46cm) models! This shipment includes: Caroline, Evelyn, Francis SP, Francis, Lillian, Natalia, Nicole, Ophelia, Tremmel, and Victor! Also, we special ordered: Oscar GIRL version because we felt Oscar's features would make a wonderful girl! Newly in stock: 17cm Tang Tang and Tao Tao, 30cm Yvonne, Silvia, and Silvia Half-Sleeping, 40cm Anthony and Marshmallow, 44cm Ben and Ling Wei Tan, 58cm Junyao! Restocks: 30cm Delia, Lorina and Loretta, 40cm Nianer and Mousee, 44-46cm Zuzana, Bohe, Bella, Ailsa, Arthur, and Wind! Our move is finally done, and shipping and processing is back to normal!